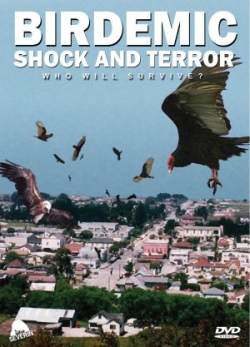 This week I watched Birdemic: Shock and Terror. I’m not really sure what to say about it. It’s either intentionally the worst movie ever made, or… I don’t know. I just don’t know. Most of the movie just follows the main character’s boring life. He eats breakfast. He leaves the house for work. He stops for gas. He gets stuck in traffic. He spends his day at work. And it goes on and on like that for quite some time, showing every little thing he does throughout his day. Then, suddenly, birds! Birds in the sky, dive bombing gas stations with airplane sound effects and explosions. Airplane sound effects? Yes, that’s right. The movie just gets worse from there. Why are birds dive bombing gas stations like airplanes and exploding on impact? That’s explained by some guy standing on a random bridge who goes on a ten minute rant about global warming. This happens again later in the movie when they meet some guy who lives in a tree house. He goes on a rant about how global warming is killing the forests and he lives there to protect the trees. The whole movie seems like a failed attempt at sending a message about global warming. I don’t know what else to say about it, other than the fact that Birdemic: Shock and Terror has the worst special effects in history. Plan 9 From Outer Space is a work of art in comparison.